A special Thank You to Harper Collins for sending me this book to review. I enjoyed the book. It has a great plot, and the story line kept me going. I'm new into dystopian fiction, I've not read much, but I love it! The whole idea of the future being bleak and back to basics just really makes the story even more suspenseful. The cover alone made me pick up this book. Although I enjoyed it, I'm a character development kind of girl. There are some situations where Eve makes decisions that are...out of character! They aren't huge, and maybe people who read this won't even notice. But, I did. The romance promised isn't as "romantic" as I thought it would be. You know I love the romance. But it was still good. I really like Caleb and can't wait to see more of him. I didn't like the ending. I felt it was, again, out of character. Not just for Eve, but for human beings. I wish I could say more, but I'm not a spoiler, so I won't! This is going to be a trilogy I think, so there is plenty of time for that "ending" to get better. I did enjoy it, and I'd still say go pick it up on October 4th when it's published. I liked it! 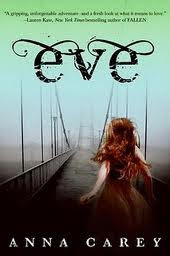 I'm looking forward to getting to know Eve better! I agree with you, I liked it, but some of the things Eve did just seemed odd, and I couldn't really connect to her. Looking forward to the next books thought - great review!